Cassidy’s has options for all your storage needs in Ottawa. Whether you need to store for a few days or a few years, we will take good care of your belongings. We can help whether you need to store things for your home or your business. You can get climate-controlled storage in our warehouse or portable storage containers that are secure and weatherproof. Contact us for all your storage needs. We can provide an online storage estimate. Some people move overseas or to a remote part of the country and can’t take everything with them. Some people are between houses and need to store for a short time. Moving from a larger to a smaller home and need some storage space. Temporary storage to make renovating a lot easier. Just plain too much stuff. Whatever the reason, Cassidy’s has over 80,000 sq.ft. of climate controlled storage in our two locations. These warehouses contain hundreds of plywood vaults that are used to store your goods securely and cleanly. It is not uncommon for goods to be stored this way safe and sound for decades. A constant temperature protects goods from freezing and warping. This is the best way to store household goods for long periods. If you are storing for a short time and want to do it yourself, Cassidy’s portable self-storage containers are for you. They can be stored at your home or in our secured yard. If you are moving and there is a delay between your old house and your new one, the containers work great. 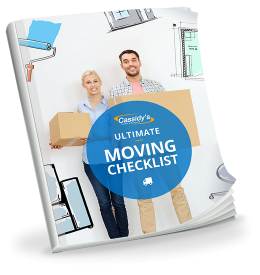 When you are selling your home and need to stage or de-clutter your place, Cassidy’s self move and store containers are the easy, practical answer. Let us bring the mini-storage to you. Please visit our site for more information and to book your container. Cassidy’s has all the storage solutions businesses large and small. Large bulky items can be securely stored in one of our fenced compounds. We have dedicated commercial warehouses where items can be stored by the skid or sq.ft. Whether you want to store one skid or tractor trailer loads of manufactured goods, inventory items, surpluses of all kinds, special project goods, store fixtures, office furniture, even dangerous goods, we store it all safely and securely. We even offer an online inventory that gives you access to the latest warehouse information anytime, anywhere. It’s like having your own warehouse and staff. For the contractor doing renovations or in need of a jobsite container, we have what you need. If you are a retailer who needs temporary storage for seasonal sales times like Christmas, many stores find Cassidy’s self move and store containers to be perfect.